General Motors has announced it will end production at five North American plants, just a decade after the company received billions of dollars in U.S. and Canadian taxpayer money and won sweeping concessions from auto unions as part of the bailout. Oftentimes union members don’t want to be too critical of the union, especially when we are under attack. But it is imperative that we question this strategy and push for militant actions. 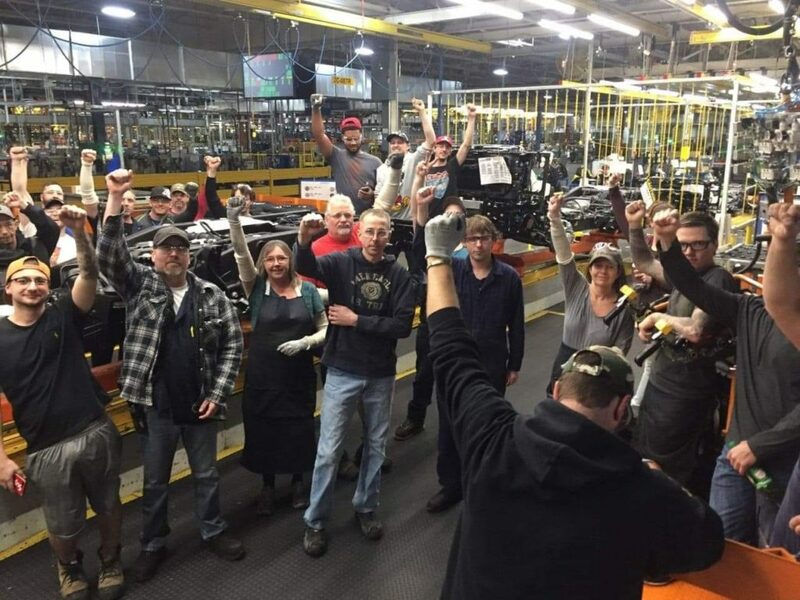 It seems like the union is totally disconnected from the anger that workers and community members have about GM’s decision, especially given the past history of union concessions and taxpayer bailout. That’s exactly right. We’ve given up so much over the years. For 10 years, we had 500 people that were classified as “Supplemental Workforce Employees, or SWEs” and were second-tier workers. They performed the same jobs as everyone else, but for far less – first 70%, later 60% of regular pay. The SWEs were considered to be somewhat like perpetual probationary employees, or contract workers. They did not have a seniority date, which is a fundamental right under any collective agreement. As non-seniority employees they did not have any layoff and recall rights, no pensions, no supplemental unemployment benefits, far fewer health care and other benefits. GM started using that category of worker in 2007 and got the union to agree to it. Initially, these positions were only supposed to be hired for short periods when there were major plant changes, but GM extended them to all the time. Finally in 2016 it was negotiated that they were going to be hired as seniority employees. But although some of them had worked for GM since 2007, they were all assigned a seniority date of September 26, 2016. They got no credit for the years they worked as GM employees. That means that if the plant closes this year, they will be considered to only have three years’ service and will not be eligible for any plant closure compensation under the current contract. These are people doing the exact same job. Our production rate is $35.42 (Canadian) an hour. But second-tier workers are currently making $20.92 to $23.91 an hour. It takes 11 years to reach equal pay. Two people doing the same job right next to each other and one is making $35 an hour and the other makes $21. The union’s justification was that this was what was needed to keep these jobs here, but as we see, it has had no impact on keeping the jobs here. It just added to GM’s profits. What’s it like working at GM at Oshawa? It’s changed a lot over the years. When I was first hired, the company was in expansion mode. There were 75 apprentices in my apprenticeship class and 400 total in the plant. In the mid-1980s we had 3,000 skilled-trades and 14,000 production workers in Oshawa. We’ve gone through a long series of layoffs and the elimination of vehicles we produce. It’s been really difficult. Today, we have about 320 skilled-trades and 1,800 production workers. We have flex lines—car production is on one shift and truck production on two other shifts. Even in our facility, we have eight or 10 other companies that are doing work associated with the plant that used to be GM jobs. Cleaning, building services, sequencing, security, and other operations are now done by workers who work inside the Oshawa plant, but who do not work directly for GM. Even the tire room has been outsourced. Thus, even though there are only 2,100 GM workers who are represented by Unifor, there are another 1,000 or more who work inside the plant for other employers—most of whom are also members of Unifor Local 222. That is just within the plant itself. It doesn’t include outside suppliers. All told there are over 5,000 direct jobs that will be lost if this plant closes. This is all happening at a time when GM’s profits are soaring. GM’s profits have been incredible since 2010. Just over the last couple of years, GM’s North American profits have been $12 billion (U.S.) annually. So they are making out like bandits. They took government money, wrote off their debts, implemented two tier systems, and all of that is going to their profits. But there is no commitment to anyone else. Why are we allowing our entire economy to run on the basis of what is best for corporations and not for our communities? That is the larger question we should be asking, rather than publicly begging GM to keep this one plant here. If GM walks away from Oshawa, then we should seize the operation and convert production to socially necessary and beneficial work. That’s the kind of issue being raised in Detroit by Autoworkers Caravan and the Detroit Democratic Socialists of America. They’re calling for making Detroit the engine of a Green New Deal. Those of us that have that outlook are hoping to raise these points at the Detroit auto show on January 18. This action has been endorsed by Local 222’s Political Action Committee and our local’s Retiree Committee. We are chartering a bus to bring workers to that action in Detroit. Unifor has also followed the UAW in making explicitly nationalistic appeals to these companies, pushing for what is best for Americans or Canadians, as opposed to what is best for workers. Fundamentally, our issues as workers are common. All workers that are dealing with GM should have solidarity with one another. I don’t see that coming from our national union’s leadership, unfortunately. They frame everything as GM betraying Canada and we need to save Canada. They aren’t trying to build common efforts for workers in the United States or to build international solidarity with workers in Mexico. Our national union has ties to the Liberal Party of Canada, which involved Jerry Dias as part of its NAFTA renegotiation team. This isn’t your first plant occupation. Can you talk about what happened in 1996 and how that informs what you think would be an effective strategy today? That was the year we went on strike. GM tried to take dies [specialized tools used to cut and shape particular parts] out of our plant while we were on strike so they could maintain production. There were parts that were produced in Oshawa that were needed for plants in the United States. Due to the strike, production in the States would shut down. So GM tried to get an injunction and seize these dies to maintain production and break the strike. In response, we occupied the plant. We learned that we shouldn’t concern ourselves with legalities, but with what is an effective strategy given the circumstances. The history of our union is that we have to occupy plants to make gains, whether that occupation is legal or illegal. In our current situation, we have more bargaining leverage with GM while they have production scheduled for our plant. Currently we are making old-model pickup trucks while the Fort Wayne Assembly Plant is being retooled for the new model. GM wants to maintain market share in the meantime. So truck production continues here. GM makes huge profits on these trucks—estimates are $15,000 per truck. The trucks we are scheduled to build here before they shut the plant will generate $1 billion in profit for GM. That gives us bargaining leverage and power over this corporation. They don’t care about a Tree of Hope. They want these trucks and this profit. We shouldn’t hand it over to them. If they want those trucks, then they have to give us something in return. We have to use our power on the job, which is far more important than ads on television. And it needs to happen before they get all the production they want. Under current circumstances, sitting down on the job is more powerful than walkouts and even traditional strikes. Once we’ve taken the plant over, we can begin to lead a national conversation about who is going to run it in the future. It would be powerful to involve the community and government in a discussion about what we can do with this production capacity once it is put in our hands for our benefit, rather than GM’s. This interview first appeared in Labor Notes, January 11, 2019.